*I receive product complimentary to complete this project. All opinions are 100% my own. Summer is winding down and fall will be here before we know it. Fall is my absolute favorite time of the year. I love the crisp air and beautiful colors. I am looking forward to spending time in my backyard enjoying the weather and looking out over the river that runs behind our house. It is lined with trees and just breath-taking in the fall. To enjoy the season even more I created a little sitting area where my lower patio will some day be. We have a deck and walk out basement below. The lower walk out is just an empty grassy area, but it could be so much more. In lieu of laying concrete this week I decided instead to add some seating to tide me over until next year. 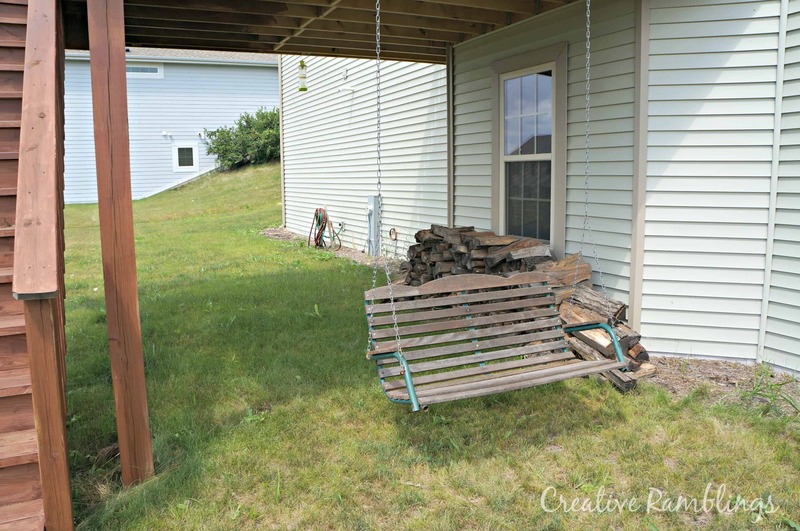 I picked up this porch swing for $15. It was solid, just weathered. It needed some love. 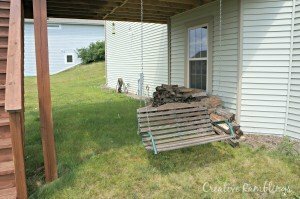 I started by hanging the swing from the underside of my deck. 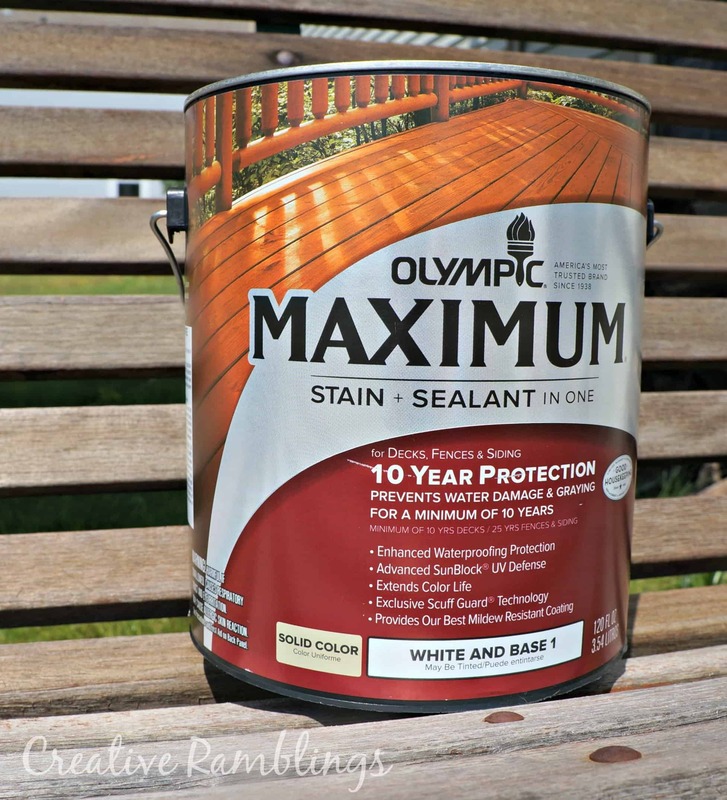 To brighten it up and protect it from the elements I chose to stain it with Olympic Maximum Stain & Sealant in One. This is a stain so it seals and protects the wood while also giving it color. Yes color! I chose Outdoor White, but honestly I could have done just about any color. There are a ton of choices. 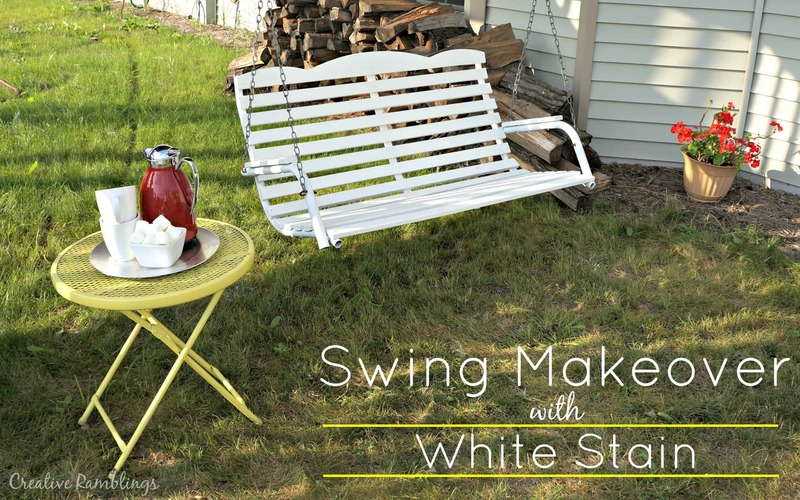 I knew this was the product for me and so excited that Olympic was willing to give me the stain to refinish my swing. (thanks!) If you have a staining project on the horizon you need to check this out. 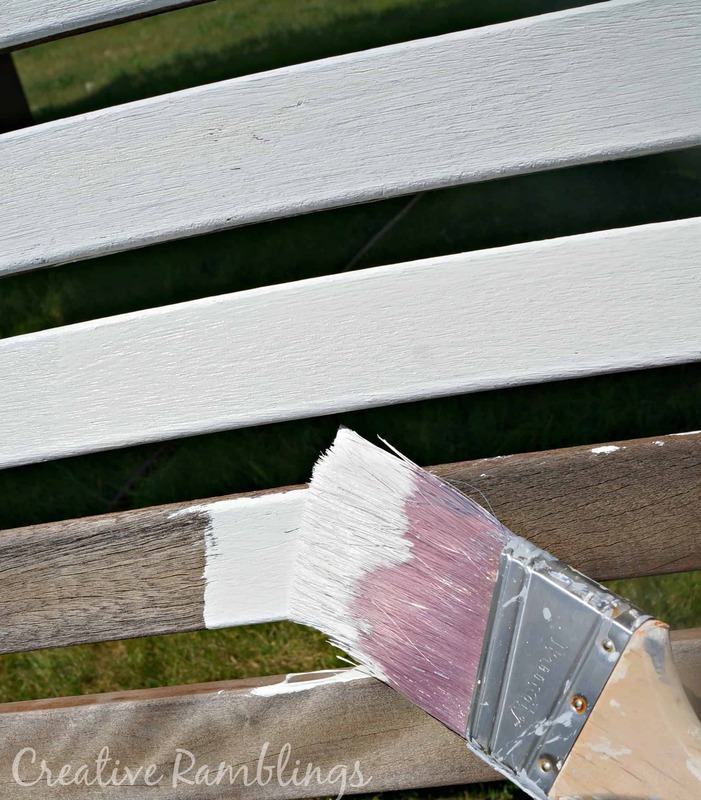 A colored stain is a neat opportunity to create an outdoor statement piece. Here’s how I brought some life back to my swing. This swing did not have any stain on it but it was dirty. I used a hard bristle scrub brush and a hose to clean it several times. I did this while it was hanging so I could get every side. Once clean I let it dry on a hot sunny day. To stain this I started on the back to test a small area and make sure it was what I wanted…it was. I used a quality brush and applied 2 thin coats, letting the swing dry in between coats. Now this swing has exposed metal between the slates. unlike paint, I could not use stain on the metal. I chose not to tape the piece and instead carefully stained the wood trying as best I could to avoid the metal. Once the stain was dry I scrapped off any that got onto the metal and then painted the metal white with a small brush. I absolutely love how this turned out. The white stain allows the wood grain to show through just a bit. It’s such a nice contrast to the otherwise dark and dull space. 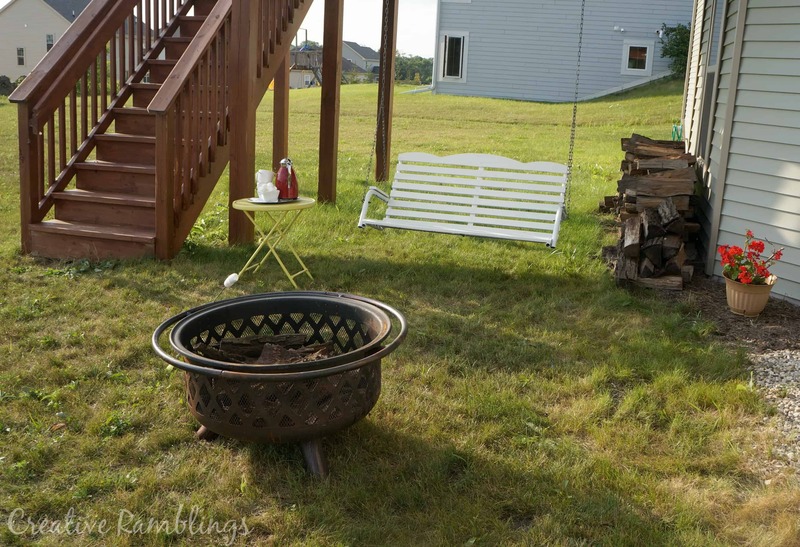 We pulled our fire pit a little closer and we are all set for late summer and fall nights. Where is your go-to outdoor space? Please share, I’d love to hear about your space. 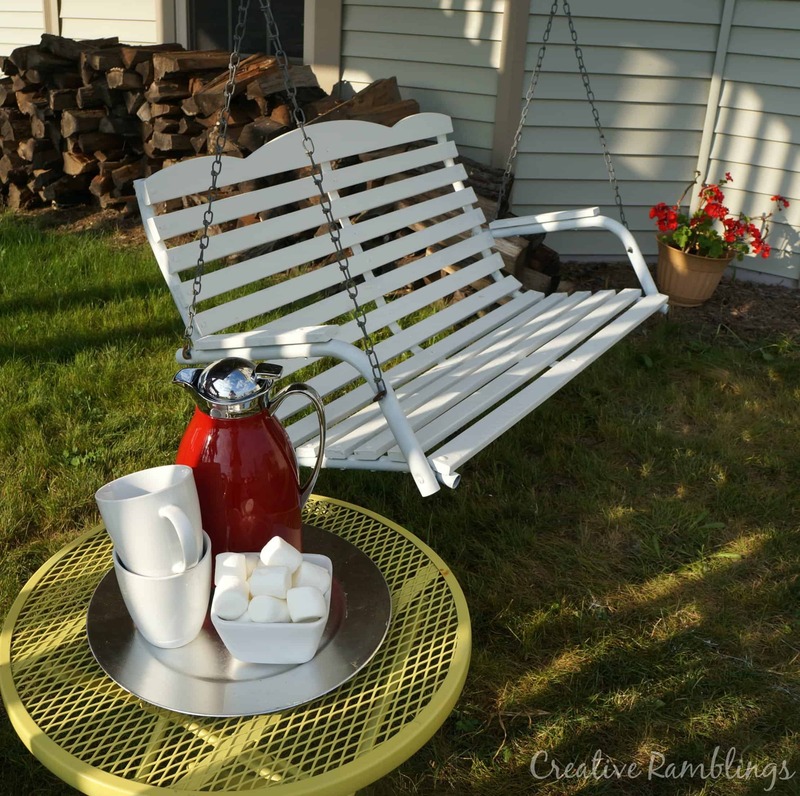 Want to see more outdoor inspiration? Check out Olympic Paint and Stain on Facebook and Pinterest. I received complimentary product to complete this project however, the opinions expressed are 100% my own. You can view my full disclosure policy here. Thank you Crystelle, it is such a relaxing spot. Sarah, this tuned out so great! Really brightens things up! Great job! That’s a beautiful swing! Great job! Don’t you just love white stain and the reassurance that it can hold up to the elements?! Great project! Yes I agree, it’s fantastic! Gorgeous makeover!! What a big difference white paint makes! Thanks for sharing at Monday Funday – Pinned! I love the cozy space you created, Sarah! Makes me want to curl up with a blanket and cup of hot chocolate! Thank you so much Sarah, I hope to do that this fall. I do agree, it’s a quaint little without anything else. Thank you so much. Thank you so much Michelle, I linked up this morning. I am in very good company with those features. Love your party.